Learn Jamie Dixon's off-season skill development workout routines! The off-season is where champions are forged. 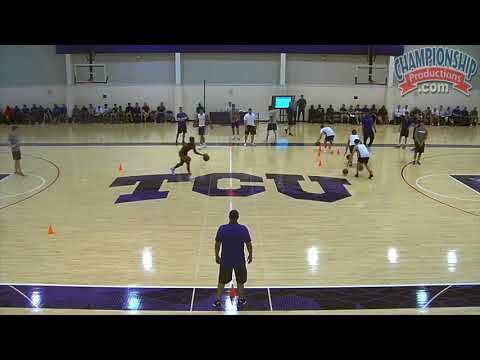 With the focus on player development and skill mastery, this video from Jamie Dixon delivers, thanks to its commitment to improve the confidence of your players on the basketball court in the off-season. Coach Dixon demonstrates essential 30-minute workouts, done four days per week, during the off-season, to advance ball handling and shooting skill mastery. To improve ball-handling, Coach Dixon puts his players through five different dribbling drills. These drills are designed to fit into a half-hour workout. Several cones are placed throughout the court that progressively get closer together to promote ball quickness. Each player in the drill uses two basketballs and works on changing directions and developing both hands. Variations are done during the course of the drill, including changing hands and varying how high to dribble the ball. The drill can also be adjusted to where a player uses just one basketball to work on dribble moves, such as between the legs, crossover, or behind the back. To improve shooting from the perimeter, Dixon demonstrates two shooting drills that go in four rounds of one minute and 30 seconds. These drills are done with a partner at each basket and challenge shooters to successfully complete the drill within the time limit. The first drill demonstrated is the "Star Drill", a 90-second shooting drill to improve shooting. Shooting from five different spots behind the 3-point line, players attempt to make two shots in a row from a given spot. The next shooting drill is "Spot to Spot". In this drill, 18 shots are attempted, starting with six shots at three groups of spots. The first and last groups are corner to wing with the players alternating between shots in the corner and shots at the wing. The middle group of spots are the slots at the lane-line extended with the players going back and forth between each of the two slots. The last shooting drill demonstrated is called "55 in 5". This drill has a player on each basket shooting 3-point shots in five minutes with the player never shooting in the same spot two consecutive times. The goal is to make 55 3-point shots in five minutes. In addition to skill development, offensive breakdowns are a must. With emphasis on his team's ball screen action, Dixon demonstrates a drill that incorporates multiple options and scoring opportunities. The drill works on the flat ball screen in Coach Dixon's offense. With a flat ball screen for the point guard and the wing in the corner coming up to the free-throw line extended, a scoring opportunity is made possible for any of the three players. The drill is varied with the point guard either attacking the basket or passing the ball to the screener or wing. Two coaches are also included to pass to the players who don't have a ball after the point guard's initial action. This is a great opportunity to see a quick and concise off-season workout, with intense and competitive drills that are perfect for your spring and summer practices or individual workouts!